You are currently browsing the archive for the Gabor Thomas category. 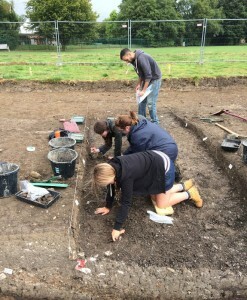 In September of this year the curtain closed on one of the department’s flagship fieldwork projects: a seven-year programme of excavation targeting an Anglo-Saxon settlement preserved under the village of Lyminge in south-east Kent. Fieldwork projects of this scale and complexity nearly always run out of time and Lyminge is no exception. 2014 was supposed to be the final season of a three-year campaign funded by the Arts and Humanities Research Council designed to investigate a large open space in the middle of the village called Tayne Field. In the event, the new discoveries made that year were so unprecedented that it was impossible to examine the evidence satisfactorily in the six weeks available. With the realisation that more work was needed, plans for a return season soon began to be hatched; by the following spring funds for a pared-down excavation had been secured from several sources, including a generous donation from a member of the Sutton Hoo Society who visited us in 2014. Game on! The cause of our extended season was first identified in a geophysical survey completed by Dave Thornley in 2012. Aerial view of the Blob and adjacent ring-ditch after initial cleaning in 2014. The ‘Blob’, as it soon became known amongst the excavation team, appeared as a large (18m by 12m) ovoid anomaly straddling the ring-ditch of a Bronze Age barrow. Both features lay at the northern margins of a dense array of Anglo-Saxon settlement remains which had formed the principal target of excavations in 2012-13. When uncovered for the first time in 2014, the feature stood out like a sore thumb: an expanse of charcoal-rich sediment crammed with animal bone and artefacts immediately recognisable as Anglo-Saxon. Gold dust – we were staring at a huge, and as we would later find out, very deep, Anglo-Saxon midden! Because all of the material removed from the Blob was dry sieved, progress was slow going and it soon became apparent that we could only investigate a small sample in the time available. We therefore limited our window to a pair of 1m-wide perpendicular transects positioned across the maximum girth of the Blob. Each of these slices produced a vivid layer-cake of dumped deposits punctuated by burnt horizons and, in one particular locale, an in situ hearth. 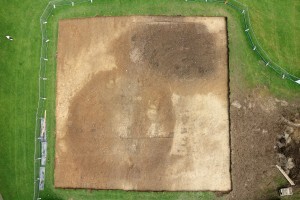 By the beginning of the final week both transects had been excavated to a depth of 1.80m, but with no sign of a bottom. Then, in the final few days, we broke through the earliest of the Anglo-Saxon dumps to reveal a horizontal layer of flint nodules. Time was up and we were left to ponder the hard-won evidence: what was the origin of the large crater used as a dumping ground by the Anglo-Saxons? And what was the function and age of the enigmatic flint layer? These questions were foremost as a skeleton team reassembled to take on the Blob with renewed vigour in 2015. Our strategy involved re-opening 2014’s transects to investigate the lower levels of the Blob (where possible) with further hand excavation, leaving the deepest portions for coring. In addition, we planned to excavate a new 2m-wide transect across the unexplored northern sector of the Blob with the aim of exposing the full extent of the layer of flint nodules. So what did we find? The upper horizons of the midden sampled by the new transect proved to be as productive in Anglo-Saxon cultural material as in 2014, yielding a further 200 sherds of vessel glass, an array of brooches and other diagnostic metalwork and prodigious volumes of pottery and animal bone. The new transect also revealed the full extent of the flint layer demonstrating that it formed a sloping ramp extending from the northern rim of the Blob down into its murky depths where it was first exposed in 2014 at depth of nearly 2m. Further excavation and coring in the previous season’s transects produced equally rewarding results. We now know that the original cut of the Blob has a strongly asymmetrical profile and that its lower stratigraphy comprises clay-rich sediments deposited during later prehistory under natural processes. Kevin Williams from QUEST assisted by Simon Maslin get stuck into some coring. So what does all this evidence add up to? I would be lying if I said we had a definitive answer so soon after the excavation, but a compelling story is starting to emerge. It goes something like this. The Blob started life as a natural feature – a solution hollow, or to give it its correct label, a doline, produced by the erosion of soluble bedrock. This particular example may have opened up early in prehistory and, as a significant landscape feature, could have acted as a focus for the construction for the adjacent Bronze Age barrow (such associations have been documented in other prehistoric chalklands, including the Dorset ridgeway). When an Anglo-Saxon settlement was established in Lyminge in the 5th century A.D., the doline was reappropriated, commencing with the construction of the flint ramp to provide access into the deepest portion of the feature. This may have been to facilitate the extraction of clay for the making of pottery and daub for buildings and furnaces, but alternative, potentially ritualistic, uses cannot be discounted. Subsequently, as the Anglo-Saxon population expanded and economic activity intensified, midden material collected from various domestic and industrial contexts was systematically dumped into the cavity. This process of infilling extended into the second half of the 6th century, but was punctuated by episodes of stabilisation when the hollow was used for industrial processes such as iron smelting reflected archaeologically in hearths and associated dumps of slag and furnace lining. Although compelling, there are parts of this story which will remain speculative until the evidence has been carefully evaluated by professional geologists. However, if the hypothesised sequence turns out to be correct in its essentials, then this will be the first example of an archaeologically-attested doline in the UK with evidence for Anglo-Saxon exploitation. 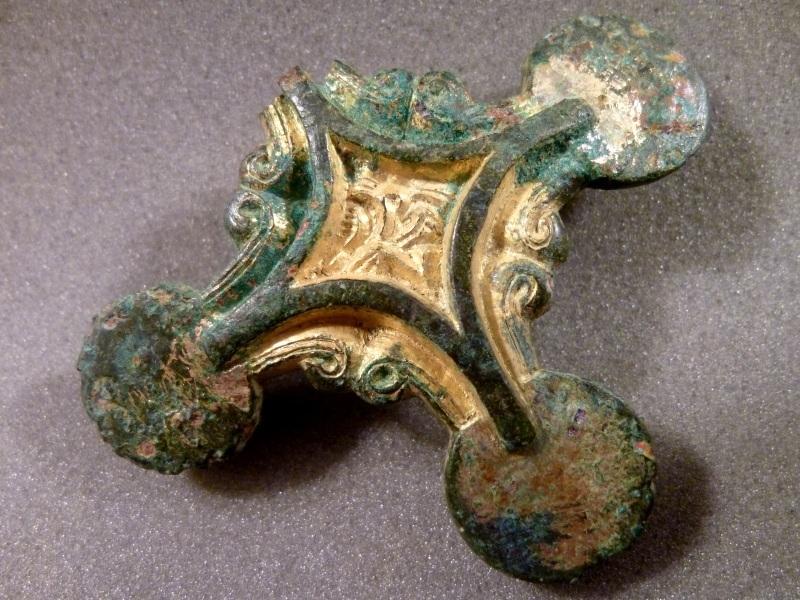 Irrespective of the final attribution, the investigation of this remarkable feature has transformed our understanding of Lyminge’s formative development as an Anglo-Saxon settlement. Should you be fortunate enough to encounter a Blob on your own excavation, be sure to go back for a second season! 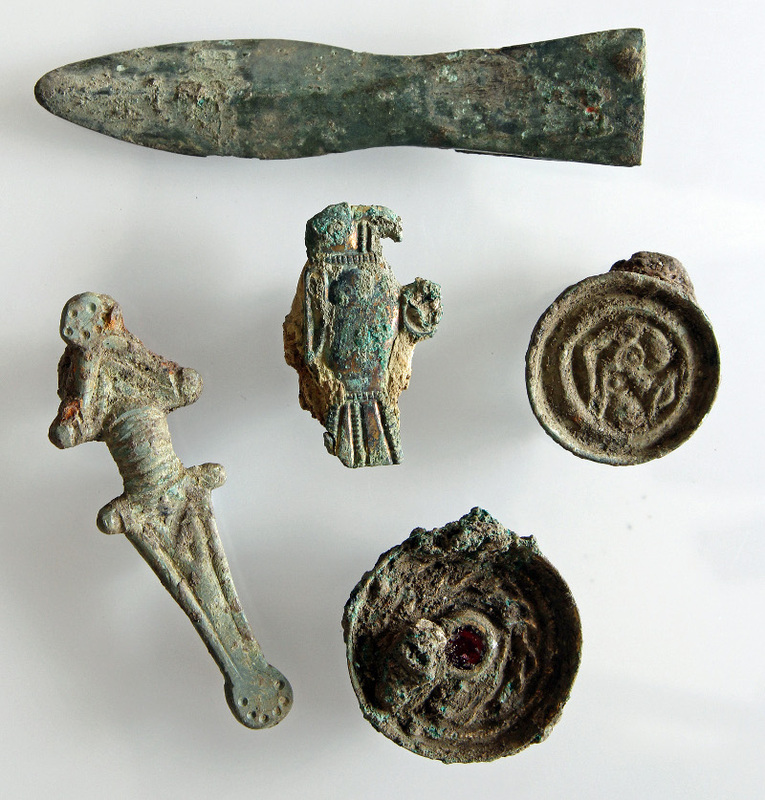 Diagnostic Anglo-Saxon jewellery recovered in 2015. The gilding and decorative detail on these artefacts will show up beautifully when professionally conserved. With thanks to my Co-Director, Alex Knox, Lyminge Project PhD and Data Manager, Simon Maslin, Finds Supervisors, Helen Harrington, Emily Harwood, Alex Miller and Jessica Barnsley, QUEST technician, Kevin Williams, not forgetting a clutch of dedicated students from Reading and UCL and our regular local volunteers. The 2015 excavation could not have happened without the generous support of Sue Banyard, the ‘Up on Downs’ Landscape Partnership Scheme and our principal funders, the Arts and Humanities Research Council. 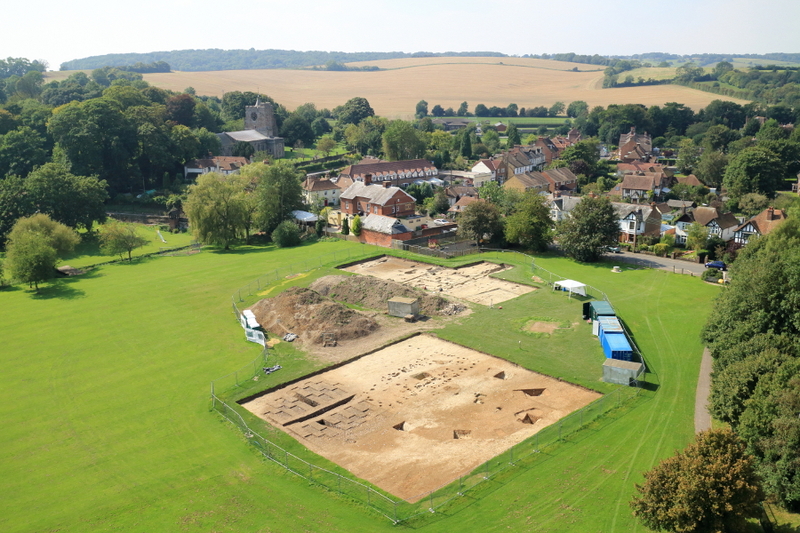 The latest film from the AHRC investigates the Lyminge Archaeological Project – an ambitious programme of archaeology which has been taking place on the village green of Lyminge in Kent. It is directed by Dr Gabor Thomas of the University of Reading, and funded by the AHRC. Check it out on our Youtube channel here! 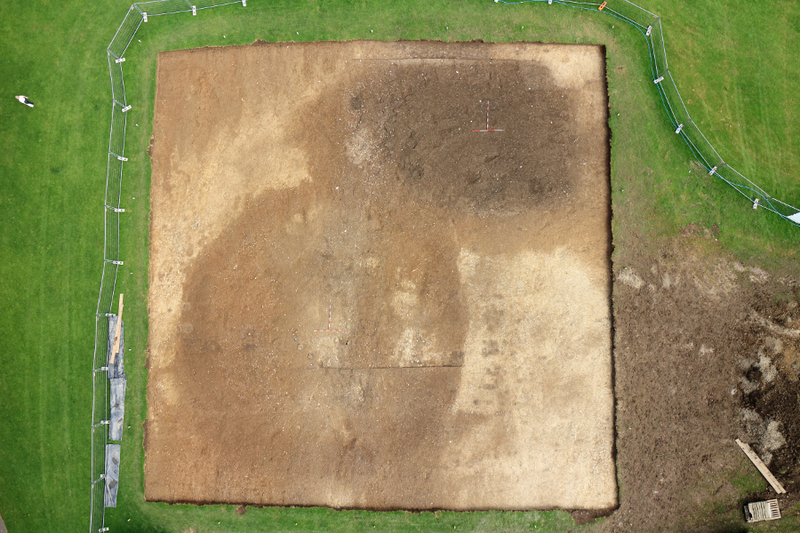 We’re pleased to announce that the interim report for the excavations that took place in the summer of 2012 on Tayne Field is now available for all to download on the Lyminge Archaeological project website: Lyminge 2012 – Interim report (PDF 3.43MB. The report provides a detailed summary of the archaeology excavated last summer and summarises the major Anglo-Saxon discoveries, including the royal feasting hall, as well as the important Mesolithic and Norman-period archaeology. It is illustrated with detailed site plans and a wide selection of colour photos of finds and features and the site under excavation. Further published reports and previous interim reports from the project are available on the website (www.lymingearchaeology.org). Archaeologists from the University of Reading, along with local volunteers, archaeological societies and university students are working at Lyminge, Kent each summer until 2014 to uncover the area’s Anglo-Saxon past. The work is funded by the Arts and Humanities Research Council. The new website contains links to the Integrated Archaeological Database (IADB) where our records are being uploaded and archived digitally. 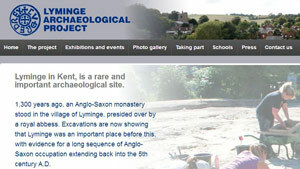 The site also contains information about the history of Lyminge and past excavations, as well as photos from 2008-2012. Information on taking part in the excavations will be provided, as well as details of talks and events about the project.